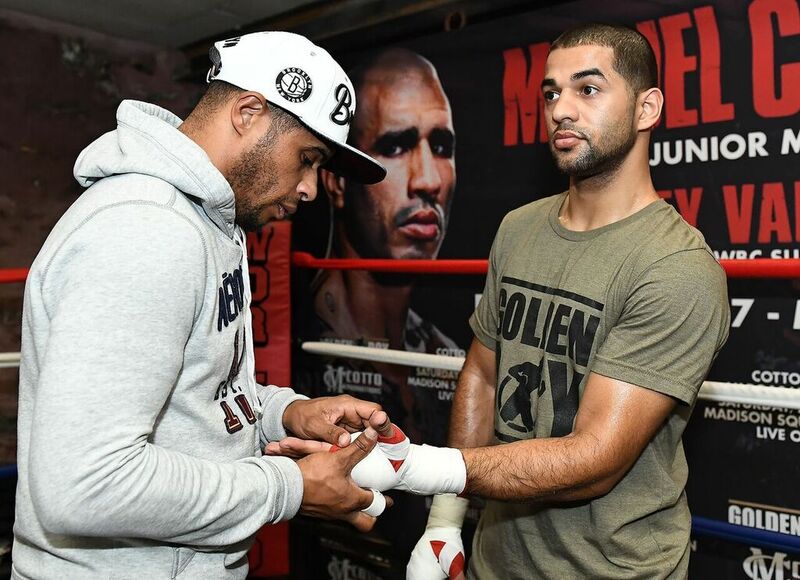 Current WBA International Welterweight Champion Sadam “World Kid” Ali (25-1, 14 KOs) today hosted a media workout at his gym in Brooklyn ahead of his fight against Miguel Cotto (41-5, 33 KOs) for the WBO World Junior Middleweight Championship set for this Saturday, Dec. 2 at the World’s Most Famous Arena, Madison Square Garden, which will be televised live on HBO World Championship Boxing beginning at 10:00 p.m. ET/PT. “I’m really excited to be fighting at MSG against a legend. I know what’s in front on me, and I know what I’m stepping up to. I’m different, I’m a bit of a boxer, I can brawl if I need to, and I have my little tricks. “My motivation is being on HBO, it being a world title, and my career honestly. People say I didn’t deserve this fight, but they haven’t been paying attention to my career. “This is my hometown. I grew up here. Cotto is coming to my territory. He’s got power; I need to focus on not getting stuck. I worked a little bit with Danny Jacobs and Curtis Stevens for this fight. “I’m so excited to be fighting at MSG. This is a fight for us here in the boroughs, for the Puerto Rican, and Arab community. “I’m an awkward fighter, and I have a pretty unconventional fight style but I can bang! Cotto vs. Ali, a 12-round fight for the Cotto’s WBO World Junior Middleweight Championship, is presented by Golden Boy Promotions and Miguel Cotto Promotions. Vargas vs. Negrete is a 12-round fight for Vargas’ WBC World Super Bantamweight Title and is presented by Golden Boy Promotions and Miguel Cotto Promotions in association with Promociones del Pueblo. The event is sponsored by Tecate, “THE OFFICIAL BEER OF BOXING,” “Hennessy: Never Stop. Never Settle.”, and Casa Mexico Tequila. The event will take place Saturday, Dec. 2 at Madison Square Garden in New York City and will be televised live on HBO World Championship Boxing beginning at 10:00 p.m. ET/PT. The RingTV.com livestream will begin at approximately 7:00 p.m. ET/ 4:00 p.m. PT.